Look. No one thought Nutella was a healthy snack. (OK, some people probably do.) But that doesn't mean it can't be a little bit shocking to see the ingredients of what you're eating laid out in front of you. That's just what an image uploaded to Reddit, originally created by the consumer center in Hamburg, Germany, has done. The chocolate and hazelnut spread famously has few ingredients. (Many say there are five, but Nutella lists seven total ingredients with small amounts of lecithin and vanillin in addition to the five listed below.) Nutella has often been thought of as a pseudo-healthy sweet in part because of its use of hazelnuts. But seeing a chart that shows how much of each ingredient is included in a jar can change that perception. Taking up the bulk of the jar is palm oil and a boatload of sugar. Palm oil has been a controversial ingredient, in part because of potential health concerns (including studies that claim it may cause cancer) and in part because it's predominantly derived from the forests of Malaysia and Indonesia. Demand for palm oil has led to a crisis scenario for orangutans amid rampant deforestation. Ferraro, Nutella's parent company, has made a point of using sustainable palm oil they say does not contribute to deforestation. Additionally, they are a part of a broader effort to create sustainable methods of palm oil production. 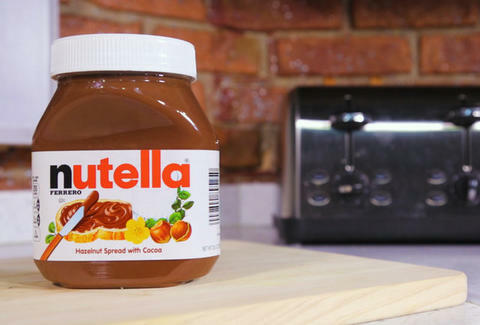 The label says Nutella contains 21 grams of sugar per 37 grams of spread. That's a lot. But Ferraro isn't hiding it. Asked for a statement, the company told Business Insider, "One of Ferrero's core nutritional beliefs is that small portion sizes help people to enjoy their favorite foods in moderation. The labeling on all our products enables consumers to make informed choices and helps ensure that Nutella can be enjoyed as part of a balanced diet." Yes, everyone should read labels. But sometimes it's hard to understand just how much sugar a given amount is. Seeing it in this manner puts things in perspective, making ads where kids eat Nutella for breakfast seem laughable. This information isn't going to dissuade most from eating so much Nutella, but it's worth knowing what's in your food. Also, you should probably never do this.